Friesen, T. E. “The Story of The Canadian Mennonite.” <em>Canadian Mennonite</em> (14 August 1959): 2. Friesen, T. E. “The Story of The Canadian Mennonite.” ''Canadian Mennonite'' (14 August 1959): 2. “High Aims and High Hopes.” <em>Canadian Mennonite</em> (16 October 1953). “High Aims and High Hopes.” ''Canadian Mennonite'' (16 October 1953). Hildebrand, Isbrandt. <em>Swath and Sheaf.</em> Winnipeg: Canadian Mennonite Publishing Association, 1970. “Introducing <em>The Canadian Mennonite</em>.” <em>Canadian Mennonite</em> (3 July 1953). “Introducing <em>The Canadian Mennonite</em>.” ''Canadian Mennonite'' (3 July 1953). Kehler, Larry. 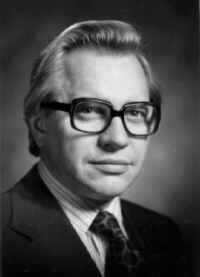 “CM will cease publication.” <em>Canadian Mennonite</em> (13 November 1970). Kehler, Larry. “CM will cease publication.” ''Canadian Mennonite'' (13 November 1970). 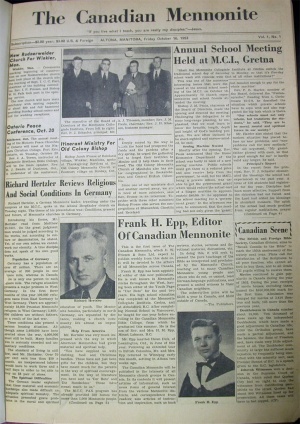 “New Venture of Faith.” <em>Canadian Mennonite</em> (5 October 1962): 1, 6. “New Venture of Faith.” ''Canadian Mennonite'' (5 October 1962): 1, 6. The Archives of the <em>Canadian Mennonite</em> are located at the[https://uwaterloo.ca/mennonite-archives-ontario/ Mennonite Archives of Ontario]. The Archives of the ''Canadian Mennonite'' are located at the[https://uwaterloo.ca/mennonite-archives-ontario/ Mennonite Archives of Ontario]. A pdf index of the ''Canadian Mennonite'' is available at https://uwaterloo.ca/mennonite-archives-ontario/sites/ca.mennonite-archives-ontario/files/uploads/files/canadian_mennonite_index.pdf. Ens, Adolf. "Canadian Mennonite, The (1953-1971) (Periodical)." Global Anabaptist Mennonite Encyclopedia Online. February 2005. Web. 25 Apr 2019. http://gameo.org/index.php?title=Canadian_Mennonite,_The_(1953-1971)_(Periodical)&oldid=142128. Ens, Adolf. (February 2005). Canadian Mennonite, The (1953-1971) (Periodical). Global Anabaptist Mennonite Encyclopedia Online. Retrieved 25 April 2019, from http://gameo.org/index.php?title=Canadian_Mennonite,_The_(1953-1971)_(Periodical)&oldid=142128. This page was last modified on 1 January 2017, at 21:43.